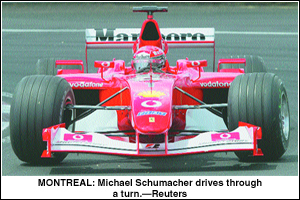 MONTREAL, June 10: Michael Schumacher celebrated Ferrari’s 150th Grand Prix win Sunday with a commanding drive in Canada that tightened his grip on a record-equalling fifth Formula One world title. It was the 59th win of the champion’s career, his sixth in eight races this season and his fifth in Canada after finishing runner-up to younger brother Ralf last year. The victory, on a sunlit afternoon at the Circuit Gilles Villeneuve, extended the German’s overall lead to a massive 43 points over Ralf and Colombian Juan Pablo Montoya. Montoya, who started on pole for the second race in a row, saw his hopes go up in smoke as his Williams’ BMW engine failed with 13 laps to go while he was second. Briton David Coulthard, winner two weeks ago in Monaco, took an aggressive second place for McLaren and prevented Schumacher’s Brazilian team mate Rubens Barrichello from securing the Ferrari one-two. McLaren’s Kimi Raikkonen was fourth while Italian Giancarlo Fisichella picked up another two points for Jordan ahead of compatriot Jarno Trulli in a Renault. Ralf finished seventh after being held up by a faulty fuel rig on a nightmare day for his team. Schumacher has 70 points, Montoya and Ralf 27 and Coulthard 26. In a race with more overtaking than the rest of the season combined and with pitstops crucial, the lead switched between the Ferrari drivers and Montoya until Schumacher finally seized control. 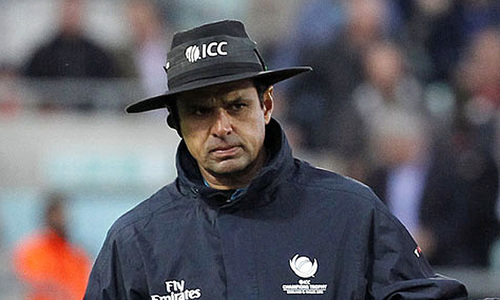 But the expected clash between him and his confident Colombian rival never happened. All eyes were on the tight opening corner as the two, whose other front row clashes this season had proved explosive, faced off again at a circuit notorious for first lap mayhem. This time everything went smoothly, the Colombian making a clean getaway — cutting across to leave no room for overtaking or argument. At the same time Barrichello accelerated through to seize second place from Schumacher. The Brazilian, clearly on a different strategy to his team mate, then took the lead and stayed ahead until his first pitstop at the end of lap 25, when Schumacher took over at the front. The safety car had earlier come out for two laps as marshals recovered Canadian Jacques Villeneuve’s stranded BAR, an opportunity seized by Montoya for a pitstop. Villeneuve was the first retirement, failing to finish his home grand prix for the fourth time in six years, with engine problems after nine laps.